About meI've been a public school teacher in Toronto for the past 20 years. I now collect 1,000s of (mostly used) books from local schools and individuals and send them to schools in Ghana. The good news is, there are about 250 public schools in Toronto, many of which have books they no longer need. 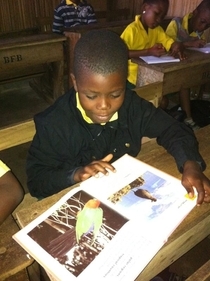 The bad news is, there are many more than 250 schools in Ghana that are in desperate need of books! About my libraryI started sending books to Ghana in July 2012. I've visited Ghana four times and my wife, who was born and educated there, has told me about the dire shortage of books throughout Ghana, even in some universities. As of May, 2014, we've sent about 9,200 books to schools there. A big thanks is due to LT and its members who have helped pay to ship some of the books with donations on our website (and our occasional Indiegogo campaigns). I have cataloged 3,000 of the earliest books sent there in this collection and will eventually catalog the first 800. We have recently (May 3, 2014) sent more books to the Keta Library (in this collection).